So, summer may be coming to a close, but it doesn’t mean you can’t still have beautiful plants. Here is some expert advice on having the best evergreen standard trees enhancing your garden. We’ve found that with privacy issues still a major concern for a lot of our clients, one type of tree that we suggest is evergreen standard trees. Evergreen standard trees have been grown and trained over a period of time, to produce their trademark clear stem, with their foliage as a canopy at the top. These trees can look very elegant and while looking beautiful in any garden can be ideal for smaller gardens. 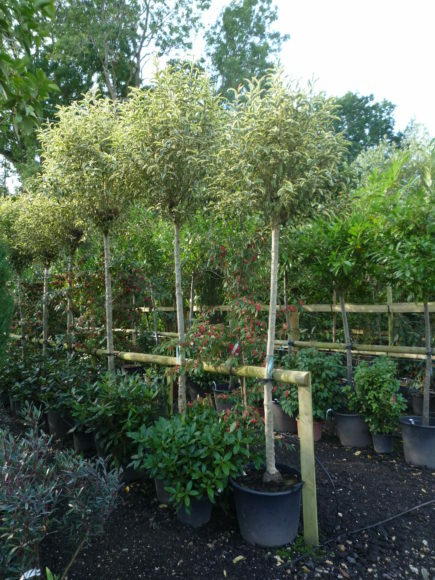 Clear stem, evergreen standard trees are also ideal for planting as an avenue of trees and this can look very effective. The canopy of an evergreen standard tree can be relatively easy to keep in shape and can be left to create its own shape, or regularly pruned into a lollipop head or cone shape for example. Many of these trees can be grown successfully in pots, especially if space is really at a premium. With the clear stem of a standard tree normally being approximately 6 feet before the first branch break, it makes these trees ideal for screenage. Once planted, the head of the tree is likely to be just over wall or fence height, thereby blocking out anything behind it. Your bed will still be free to plant up other small trees and\or shrubs to create an instant effect, with varying heights which makes your planting scheme much more interesting. Ligustrum japonicum lucidum ‘Excelsum Superbum’ is an evergreen tree. It is great for using as a screening tree, as it almost brings light into the garden rather than blocking it out. It has ovate leaves that are tinged light green with creamy-yellow edges. Ligustrum japonicum lucidum ‘Excelsum Superbum’ produces creamy flowers in late summer. These are followed by black fruits in the autumn. These are not suitable for human consumption. It will grow happily in shade\semi-shade. It is a hardy evergreen, but may drop its foliage if the temperature falls below -10. One of our favourites – Hoheria sexstylosa ‘Snow White’ is an evergreen tree with a pyramidal shape. It produces masses of stunning white flowers in June\July. It has an eventual height of 5m. However, it can be pruned to a size in keeping with its surroundings. Hoheria sexstylosa ‘Snow White’ is classed as reasonably hardy and should be able to withstand temperatures between -5 to -10. However, if it’s on an exposed site or in severe weather conditions, it can be damaged. We would recommend providing shelter in cold areas. Quercus ilex is an evergreen tree. It has small leathery dark green leaves, with a white\cream underside, and black finely cracked bark. Yellow catkins appear in spring. 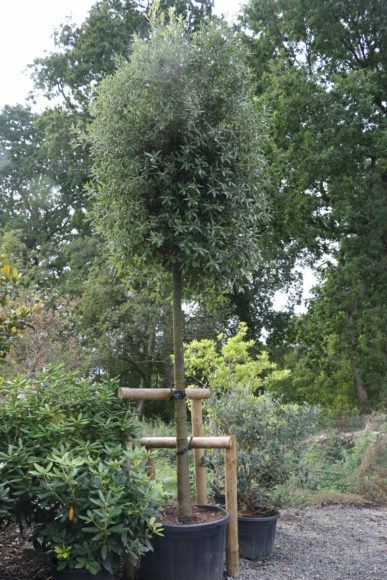 Quercus ilex can be planted in full sun or partial shade, in a sheltered or exposed position. It prefers a moist, well drained soil. Being an oak, this tree can get massive. Annual trimming will keep the tree in shape and under control. If you are near the coast, this is a very good choice, as it is able to cope with the salt conditions. It has an eventual height of 12m+ and a width of 8m+. Another one of our favourites – Photinia x fraseri ‘Red Robin’ is a highly ornamental evergreen shrub with dark green leaves which are brilliant red when they are young. Photinia x fraseri ‘Red Robin’ produces small white flowers which appear in April-May, and these are sometimes followed by bright red fruit later in the summer. It is an ideal evergreen specimen shrub as is comes in many forms – bush, standard and half standard. Photinia x fraseri ‘Red Robin’ can be kept regularly trimmed which will enhance the colour and encourage dense foliage. This therefore makes it an ideal shrub for screenage. 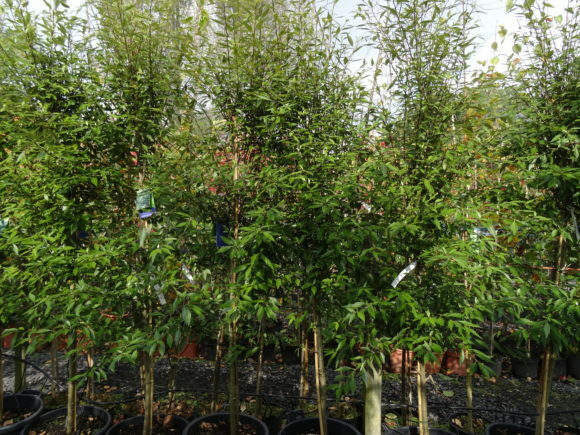 With our great selection of evergreen standard trees in stock, why not pop in and have a look? 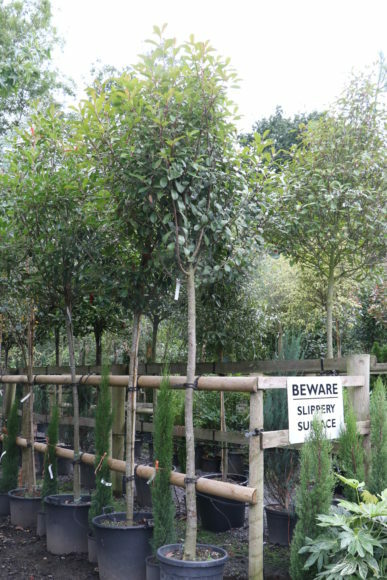 Our knowledgeable staff will be very happy to assist you with purchasing the right tree for you, or even if you just need some gardening advice.